Feed the Shoggoth! has both the look and feel of some more classic take-that style games like Munchkin, for better or worse. There's not much in the way of strategic depth here, but its perfectly serviceable for those who enjoy a quick, toothy game. When we were in college, we played a lot of fast, light, take-that style games. You know the kind; often card-based, cartoony art, gameplay that’s nothing short of violent? We ate up games like Munchkin, Grave Robbers from Outer Space, and a handful of others, and while our tastes have changed a lot since then, we definitely whiled away a lot of fun hours with that kind of punchy, short-form game. Feed the Shoggoth! undeniably recalls those games with both its tone and its mechanics, and even its aesthetic. So does that mean we’re as over it as we are those other games? Or is the warm light of nostalgia enough to keep us interested? Diana: Well, none of that applies to me – I never really played those games, so I come in without these preconceived notions. I’m the control group in this experiment! 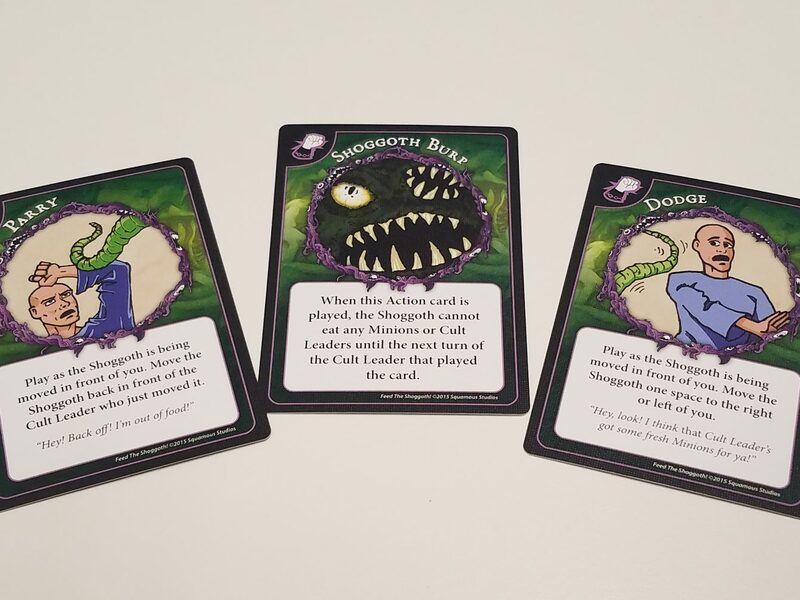 In Feed the Shoggoth!, all the players are rival cult leaders (each with a unique player power) who have gotten together to summon up the titular Shoggoth, an unspeakable monster from Lovecraftian nightmare. Fun stuff! 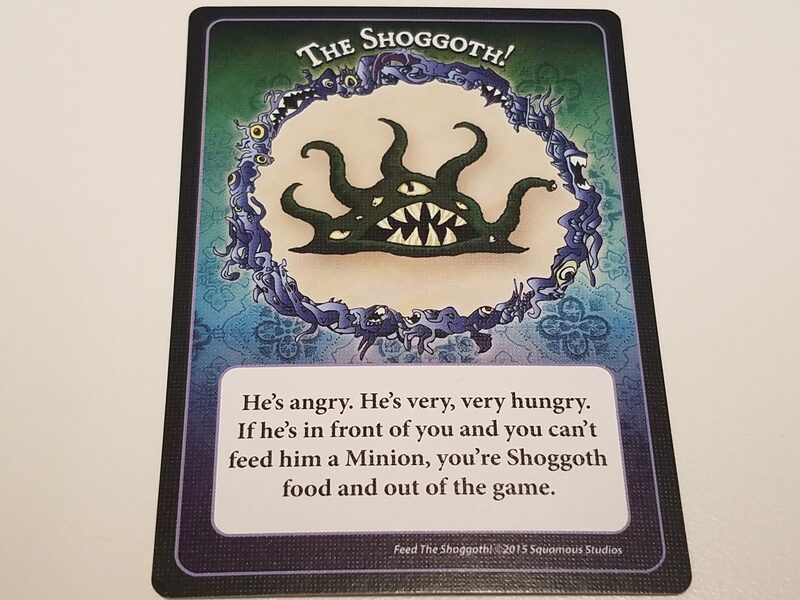 Well, shoggy here has a pan-dimensional hunger, and to satiate this horror (and earn its favor in the form of points), we cult leaders are going to shove as many of our hapless minions down the creatures gullet as fast as possible. Jess: The secret is to coat your minions in a delicious glaze before offering them up. Something with ginger, black garlic, shallots, and honey usually works wonders! Diana: See, I like to go the other way. Lots of citrus, lots of herbs. Think pepper, cilantro, lemongrass, and lime. Andrew: That all sounds delicious!…wait, right, you’re talking about eating people. Gotta remember that. 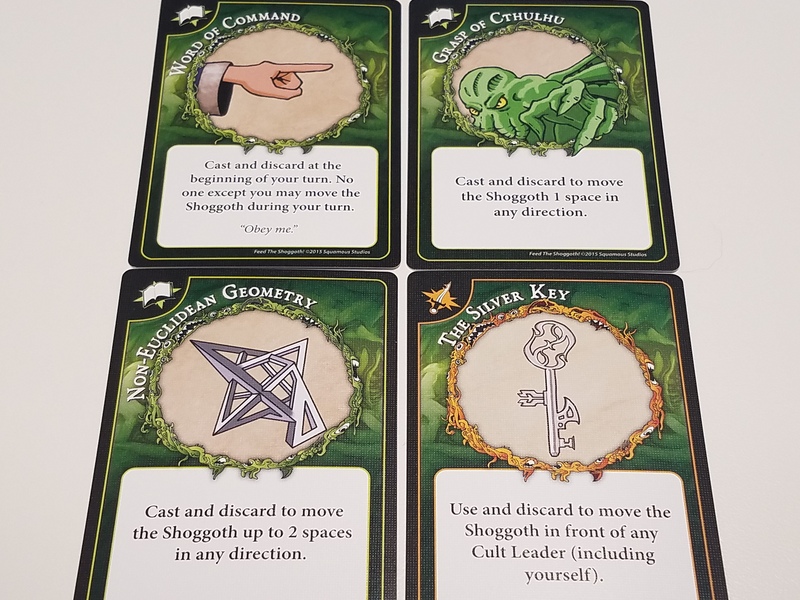 Of course, the other cult leaders aren’t going to let you just go feeding your followers to the mighty shoggoth all willy nilly – gameplay revolves around using spells, artifacts, and other underhanded methods of messing with your opponents to undermine their efforts. 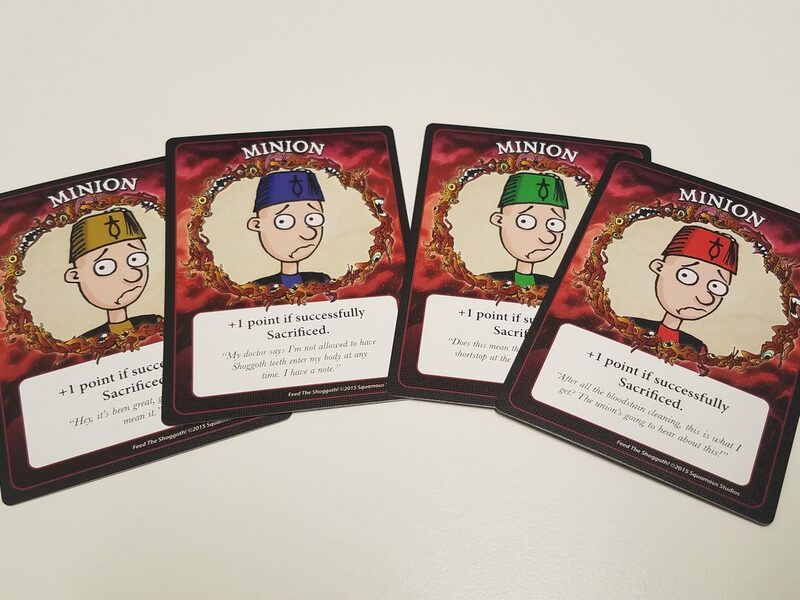 You’ll be constantly stymieing your fellow doomsday worshipers, buying you time to feed your own minions to the beast, but if you’re extra clever (and lucky), you’ll arrange it so that Mr. Shoggoth goes and visits a cult leader who doesn’t currently have a tasty minion to feed it, and that means that it’s your fellow player who ends up in the Tummy of Darkness and out of the game. As soon as someone either gets enough points or is the last person not eaten, they win! Jess: Tummy of Darkness would be a good band name. Andrew: Thanks! So what did you think? Jess: Well, you were right when you said Feed the Shoggoth! has that Munchkin-ey vibe. It’s a game all about messing with your opponents’ day, and hopefully getting them killed. That doesn’t do much for me these days, you know? Lots of cults, each with a unique power. We love that! Diana: Yeah, I kinda feel the same way. It was a lot of stabbing and stealing. I totally see how it has charm for people who like that sort of fast, contentious gameplay, but it’s just not for me. And I found the art, uh, uneven. Andrew: Well, you are an artist, but that didn’t particularly bother me. I actually thought some of the art was pretty cool. Everything the two of you say holds up, though – this is a toothy little game, something that some groups will have fun with, but many probably won’t find deep enough to keep everyone engaged, particularly if you tend to tire of chronic backstabbing. 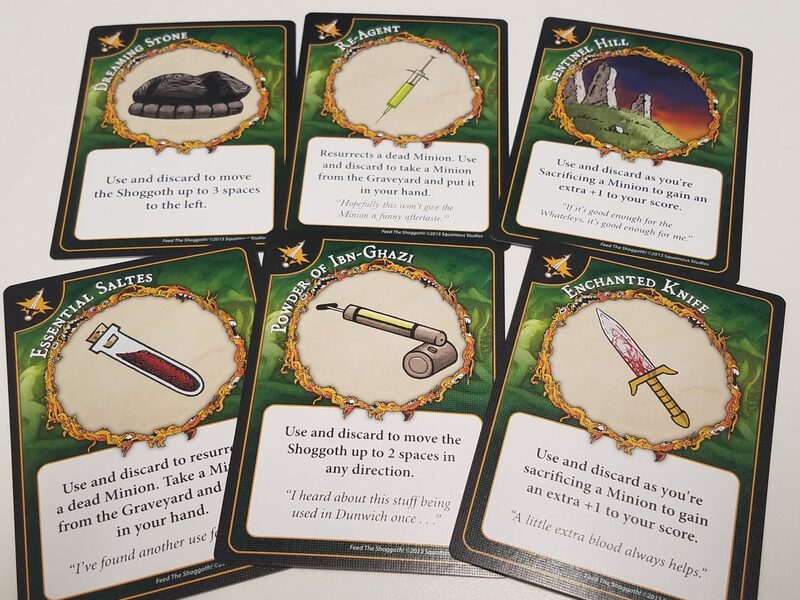 Jess: On the other hand, it’s not the time-sink of a game like Munchkin, so it avoids some of the problems there – Feed the Shoggoth! is clearly designed to be pretty quick and light, and that’s definitely to its benefit. By keeping things moving, it stops the game from stagnating. Diana: Definitely. Feed the Shoggoth! was at its best when it was quick and dirty, with cultists getting eaten left and right and cards constantly changing hands, and that’s often how it was. That’s not my preferred mode of play, but it was what this game needed to be. So in that regard, it was pretty successful. Andrew: One thing I wasn’t expecting but really liked was that each cult had its own power. They didn’t impact the game tremendously, but it was nice that there was some variety and it did help give you something to form your strategy around. 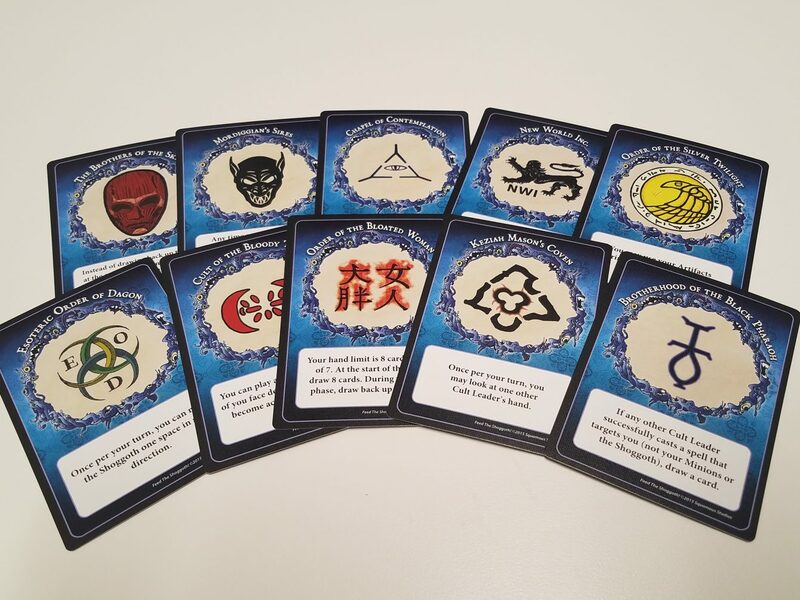 Jess: Totally And there’s undoubtedly expansion potential here, for more cults, more artifacts, more everything! On the whole, Feed the Shoggoth! is a fine addition to a genre of games that we kinda lost interest in some time ago. There was a little cleverness here and there with the way some cards interacted, but on the whole, Feed the Shoggoth! packs no surprises, so you either like that sort of interaction or you don’t. Not for us, but definitely for some. 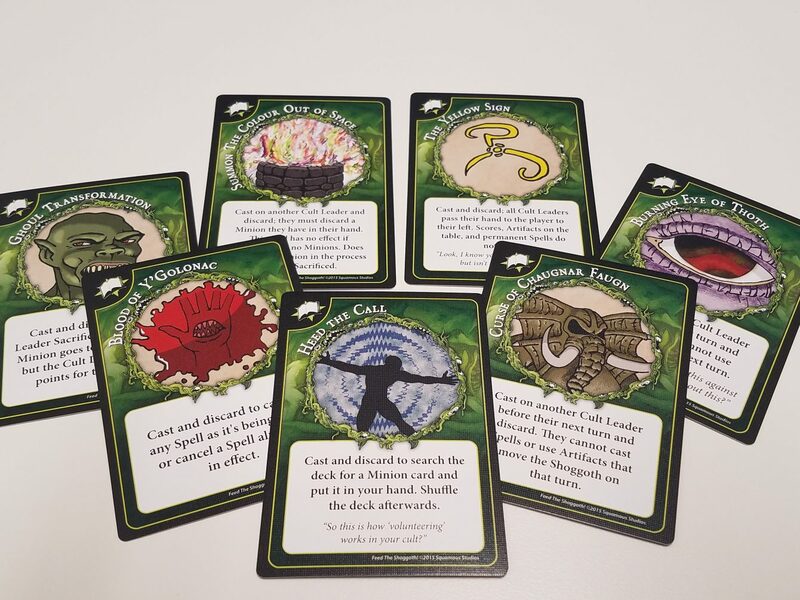 Andrew: Who would have guessed – a game called Feed the Shoggoth! is exactly what it says on the card box. 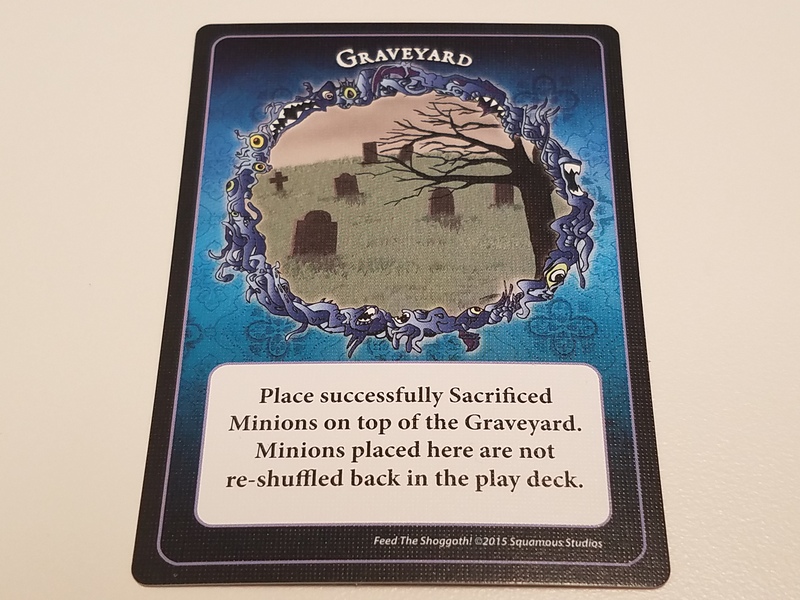 Jess: Yeah, a card box full of delicious minions. Hungry for some contentious cult action? Order Feed the Shoggoth! directly from the publisher! Previous Post:Renegade Preorders Open for Kids on Bikes Accessories!